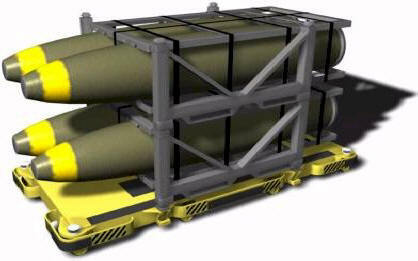 The NAVSTORS Omnidirectional Guided Vehicle (OGV) is a lightweight, low-profile robotic vehicle specially designed to transport Navy containers and pallets aboard ship, and replace many of the forklift trucks, pallet-jacks and other manually-operated ordnance/material-handling equipment used today in the movement of such payloads on the upper decks, and into and out of elevators, magazines and holds. Individual pallets or containers as well as stacks of payloads—or NAVSTORS “configured loads”—are lowered in place on the OGV and secured for transit by the Standard Payload Interface’s integral locking features. OGVs are capable of delivering weapons or stores at a rate that will support the most aggressive operations.